Calculate the Postage Price for anything instantly with a Postage Meter. 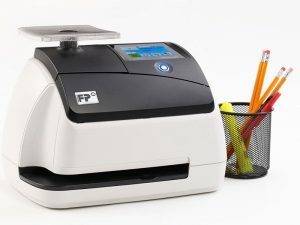 With a Postage Meter, you buy and print your postage from your desk! I Know…I know…. you hardly send any mail, but if you do send a large letter or Parcel, how do you work out the postage price now? There are 3 prices for large letters based on weight. $2:00, $3.00 or $5.00. A Postage Meter will calculate the Postage Price instantly! Parcel costs are based on weight and the distance to the delivery point, a Postage Meter asks you for a Post Code and then calculates and prints the postage price. Meters will instantly calculate the postage price of large letters, parcels, satchels and International Mail meaning you print the stamp and place the mail into any Postbox anywhere! Alternatives to a Postage Meter are – Stamps – (guessing the postage price or having to calculate each item) – An Australia Post account meaning you must calculate the cost’s, fill in a detailed form and then take the mail to the Post Office. – or pay $12.00 per day to have the mail picked up. A small inexpensive Postage Meter will not only save you a huge amount of time but will also save you money. With a Postage Meter, you can send any Envelope, Parcel or Satchel as an ‘Express Post’ item without needing to buy the ‘Express Post’ items, you simply attach a free ‘Express Post’ tracking label to the item your sending then place the item into any yellow Post Box anywhere. On top of all this Australia Post offers a 2.5% rebate on all postage spent through a Postage Meter, including bulk mail, large parcels and ‘Express Post’. https://www.fpmail.com.au/wp-content/uploads/2015/10/FP-logo-300x210.jpg 0 0 juantee https://www.fpmail.com.au/wp-content/uploads/2015/10/FP-logo-300x210.jpg juantee2018-05-09 01:43:372018-05-09 01:47:23Why You Need a Postage Meter!